Let me get this out in the open right here: the psychedelic era Them is nowhere near as good as early Them, particularly Them’s first LP and the early singles with Van Morrison (I’m sure psych fans will take issue with this!). Early Them was a hard edged British R&B group who was both innovative and revered in their day. Van Morrison is a legend, however, and Them’s early work is considered some of the best pure rock n roll from that time frame (64-66). That being said, this album is a pretty good psychedelic record though not the masterpiece dealers and rock critics make it out to be. This is the kind of album you purchase after you’ve heard a few hundred or so classics and are thirsting for more UK psychedelia. The musicianship is way above average, particularly Jim Armstrong’s guitar work. Mean lean fuzz leads are painted all over this album. 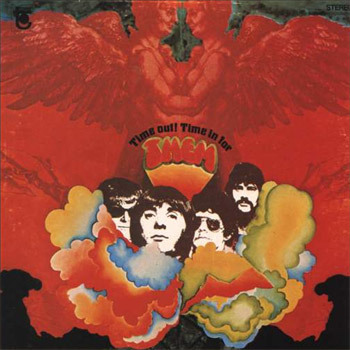 The opening cut “Time Out For Time In” is very good with jazzy time signatures and effective sitar work. Some of the tracks are marred by dramatic vocal phrasing and pretentious lyrics but that’s a minor complaint. Exotic numbers like “The Moth” and the lyrically bizarre “Waltz of the Flies” work best, employing a variety of instruments (mandolin) and strange sounds. Another highlight, “Black Widow Spider,” is a classic sitar headswirler while the boys give a good blues psych reading of “I Put A Spell On You” (titled here “I Put A Hex On You“). “I Can Only Give You Anything” is an absolute gem of 60’s rock & roll! Even ask Beck.